The career paths of dual degree graduates are as varied as the degrees they pursue. Recent employers have included Fortune 500 companies, large law firms, government agencies such as the U.S. Food & Drug Administration and Environmental Protection Agency, and the U.S. Senate, just to name a few. Our dual degree students are supported by a dedicated career counselor focused on their specific career path. In addition to one-on-one guidance, the Career Center team provides access to networking events, hosts career fairs, offers workshop and training opportunities, and works tirelessly to cultivate employment opportunities. Dual degree students are also paired with an academic advisor with expertise in counseling students pursuing two degrees and, where possible, an alumni mentor who completed the same dual degree program. 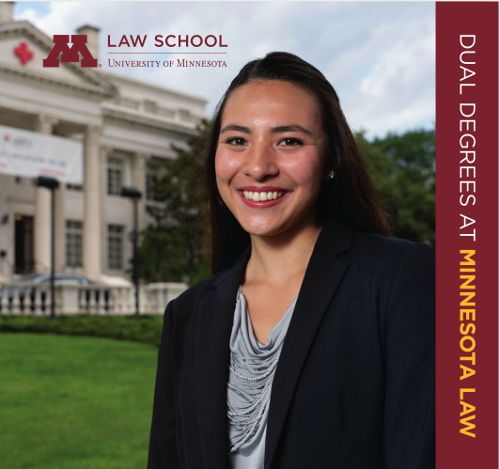 Read more about Dual Degrees at Minnesota Law.